LinkedIn improves its search capabilities to make it easier and faster to find people, companies and jobs on the professional social network. Whether you are looking for a new job, a new employee, or someone – anyone -- who can help you figure out how big data fits into social networking wrapped around analytics, search is a key function on LinkedIn. The professional social network this week announced changes to its search capabilities targeted at streamlining and relevancy. There were 5.7 billion professionally oriented searches on LinkedIn last year, according to LinkedIn product manager Johnathan Podemsky in a blog post announcing the improvements. "Today, search on LinkedIn is getting even smarter and more streamlined," he wrote. These improvements are among several that LinkedIn has made recently to its platform, including an update toLinkedIn Jobs. Here are 10 things you should know about LinkedIn Search. Probably the most important thing about the new LinkedIn search is that the tool is now conveniently unified. Before, you had to search separately on people, companies or jobs. Now you can type what you are looking for in the search field and results will be pulled from across LinkedIn people, jobs, groups and companies. As you type in your search terms, LinkedIn search will predict what you are looking for and autocomplete your term. 3. Suggested Terms As You Search. LinkedIn now provides suggested terms as you search. This will be useful for, say, when you are searching on "editor" jobs, not realizing that the hotter term now is "content developer." 4. Smarter Query Intent Algorithm. According to LinkedIn, the more you search, the better and more relevant search results will get. LinkedIn's new advanced search capabilities make it easier to expand your search by using filters, such as company or location. The co-founder of LinkedIn, Reid Hoffman recently published his new book “The Start-Up of You”, see a book review here. One idea is what they call “I-We” – how the power of your network out to the third degree magnifies your individual capabilities. It used to be “who you know”, now it’s also “who the people in your network know”. That’s the strength of “I to the We” of your network. Following in the footsteps of Facebook, which recently overhauled its search, LinkedIn on Monday announced a revamped search with auto-complete, suggested searches and other enhancements. The search is now streamlined as well, so you no longer need to search for companies, people and jobs separately. "Now, all you need to do is type what you’re looking for into the search box and you’ll see a comprehensive page of results that pulls content from all across LinkedIn including people, jobs, groups and companies," LinkedIn's blog explained. Auto-complete: LinkedIn will suggest options for what you're searching for. Suggestions will improve the more you search thanks to a smarter query intent algorithm. Suggested searches: As LinkedIn explains, "now when you type in a search term such as 'product manager' you’ll see example search queries for people or jobs related to product manager as well as a preview of top results to help you find what you’re looking for in one click." If you're in the market for a new job, today's hiring managers agree that one of the most important things you can do to improve your chances is be on LinkedIn. "There are a lot of social networks," says Shilonda Downing, owner of Virtual Work Team LLC, a Homewood, Ill., human resources recruiting and staffing firm. She says LinkedIn is the go-to site for professionals and that, "These days, it's very important for your career to have a presence on the site because there's a high likelihood that wherever you're applying, the recruiters there use LinkedIn, too." As of Dec. 31, 2012, LinkedIn reports that it has more than 200 million members in more than 200 countries. But it's not just LinkedIn's popularity that makes it a must-have for job seekers. According to many career counselors, LinkedIn is often one of the first places recruiters will look when researching an applicant. Simply getting found on LinkedIn is only a small part of the equation. At a minimum, job seekers need to make sure they have a presentable profile that will help them make their case to recruiters. But beyond the basics, experts say there's plenty job seekers can do to improve their chances of getting hired. It may sound obvious, but you need to take the time to complete your LinkedIn profile, says Laurie Berenson, president of Sterling Career Concepts LLC in Franklin Lakes, N.J.
"To effectively complete your profile, don't forget three items: a professional picture, a strong headline and a fleshed out summary section," Berenson says. The picture needs to exhibit professionalism. Job seekers should use a picture where they're smiling and dressed in business attire, Berenson says. Distracting backgrounds are a no-no. Use the headline -- which Berenson calls "prime real estate" because it follows your profile -- to set yourself apart from the pack. "The key to writing an effective headline is to include not only your title or job function," Berenson says, "but also your unique value or what you bring to the table that someone in a similar role doesn't have." And when it comes to the summary, Berenson says to present who you are, what you have to offer and what your goals are. Of course, the summary content should also match what's in your resume. One of the best ways to use LinkedIn connections is to secure recommendations -- testimonials from people who know you professionally and can speak to the caliber of your work. "Employers want to get a full picture of you as a professional, and recommendations are a great way to round out your profile," says Kat Krull, associate marketing manager at Resunate, a Pittsburgh company that builds resume-evaluation software. "Ask former supervisors or colleagues to write a short blurb about you by sending recommendation requests." According to Krull, a good tactic for securing recommendations is to offer one in return. Doing so is also considered good form. Brie Reynolds, a Dallas-based manager of content and social media at FlexJobs, says it's critical to stay in touch with contacts so that those recommendations don't stay static. "Set a goal for yourself that every month or week, you'll send a quick message to five to 10 of your LinkedIn connections just saying hello and wishing them well," says Reynolds. "In your note, inquire about their careers and lives, and mention that you'd like to stay in touch. By staying fresh in people's minds, they're more likely to think of you the next time they hear of a job opportunity that fits you." Growing your network is a great asset on LinkedIn, but you need to seek out introductions where appropriate, says Saad Ahmed, an engagement strategist with Viget, a digital design and development firm based in Falls Church, Va.
"The best strategy to gain an introduction is to first figure out what you are seeking from an introduction, and then figure out who at an organization can help you answer your questions," Ahmed says. "Getting an introduction to someone you don't know or aren't connected to isn't too difficult as long as you have a good reason to reach out. A good reason usually entails research or advice. A bad reason is if you're going to beg them for a job." As far as etiquette goes, Ahmed says it "boils down to being considerate, thoughtful and asking good questions." He warns that if you're pushy, overly eager or not considerate of other people's time, there's a good chance that introduction won't go anywhere. Like any social network, LinkedIn puts a high premium on activity. So it's a good idea to update regularly, according to Wayne Breitbarth, author of "The Power Formula for LinkedIn Success: Kick-start Your Business, Brand, and Job Search." "Your network will probably lead you to your next great opportunity," he says. "So it's important to keep your smiling face and relevant business-related comments in front of them on a consistent basis." But don't go overboard. A few updates a week, up to once a day is plenty. Remember to stick to business, and if possible, make your updates useful. Also try joining relevant groups and participating in the conversation. "Joining groups within your profession or industry can do two important things," says Karen Southall Watts, a business trainer and career coach from Bellingham, Wash. "You can establish a reputation for being informed or an expert in your field … by freely sharing your ideas and wisdom. But you can also use those discussions to learn from the thought leaders in your field." But Watts says to remember to keep discussions professional and substantive. Asking how to find a job isn't helpful, but asking something specific about the industry is a great way to showcase your professionalism. The answer to the question is slightly subjective although it is a good idea to have some sort of time range in mind. You should figure that if you spend between 15 to 30 minutes a day on LinkedIn. It is important to make a commitment to working it consistently (and, if possible, trying to do it at around the same time each day). Please bear in mind that that time range for consistent LinkedIn use is a minimum. If you are in a business that depends more heavily on LinkedIn interactions, you should use it more than that each day. One of your purposes in using LinkedIn is to make sure that everyone is constantly aware of your brand and your offerings. As you are starting to keep your LinkedIn schedule, you should try to be as consistent as possible in your approach so that you get maximum results from your efforts. There is a way for you to arrange your Email account so that you receive a notification for everything (all invitations, group discussions, updates to status, etc,). That way, you won’t waste time on LinkedIn. You want to try to be as productive as possible always. If you are interested in doing that, you need to go to your account settings and request “Web Only” notifications. That will force you to be more conservative with how you use LinkedIn. It will also force you to login to your LinkedIn Homepage to be able to read your notifications. Once you have done that, you will find it easier and more convenient to spend the consistent 15 to 30 minutes on a daily basis to which you have committed. It is a really good idea to try to use LinkedIn at the same time of day on each day, if possible. It is a good idea because people will get used to interacting with you at the same time and you have a better chance of developing meaningful relationships with more people if you have a consistent approach on LinkedIn. It is important to be as efficient as possible with your time on LinkedIn. One of the reasons why LinkedIn is such a valuable social media tool is that it will really help you to increase the number of people with whom you can connect and with whom you can establish relationships. You should establish your LinkedIn routine early on, if possible. When you login to LinkedIn, you should post some sort of update, if you have one (which you most probably will have). You can write the updates that you want to post for the week in longhand and post one at a time throughout the week. Using links in your daily posts that lead to useful articles for your readers is a great thing to share (at least once a week). Undoubtedly, many people will find those articles very useful. Updating your status every day lets people know that you are there and that you are interested in interacting with them. After a short while, people will look forward to your updates and will be disappointed if you don’t send them on a daily basis. Remember, you can change your LinkedIn status as much as you need to. What kind of job do you want? Whatever you are seeking, make sure you put those keywords in your profile. Think about it…how does a hiring manager search for candidates? He puts in the job title he is looking for into the search box. So make sure you have your desired job title in many places on your profile so you come up high in LinkedIn searches. Just one click and suddenly I had invited 648 people—many of them strangers– to join my LinkedIn network. As my computer screen madly scrolled with acceptances, I sat there embarrassed by my new, elite networking status—I now belong to the 500+ connections club. Just as I had been duped by Facebook years ago, allowing them to access my email list and invite people to see my photos, LinkedIn had now hoodwinked me in a similar fashion. After years of politely asking strangers seeking to connect how it was that I knew them, I now looked guilty of prostituting myself to hundreds of people for the sake of appearing really connected. Ugh. Nor did I customize any of the 648 invites, avoiding the generic “I’d like to add you to my network” wording—something I had done consistently in the past in an effort to make my invitations more personal. What was interesting is how many people said yes. In less than 10 minutes, I had 80 acceptances. Many were from people I knew, but several were not—they were connections of connections, i.e., strangers. By day three of my Linking nightmare I had more than 200 acceptances and the LinkedIn sidebar informed me that I was now connected to more than 10 million professionals. That means I theoretically “know” more people than the entire population of New Jersey, the 11th most populated U.S. state. This Pavlovian response to LinkedIn invitations defeats the entire idea behind creating an effective network. Only two people wrote and questioned the invitation and in both cases I explained my mistake and suggested they decline. Everyone else either blindly clicked “accept” or ignored the invite. In a handful of cases people used it as a sales opportunity: how can we help you? Whether you are gaming the system or not, mining emails to grow your network through other people’s second and third connections is diluting the benefit of LinkedIn. If someone sees that I am connected to a venture capitalist and asks for a warm introduction, am I going to do that for a complete stranger? No. Followings its last major update—the redesign of profile pages—LinkedIn announced another makeover, this time to its job search feature. "We want to help you find your dream job and the new LinkedIn Jobs experience has been completely redesigned to connect you with the right career opportunities and tools to help you take advantage of those opportunities," says Vaibhav Goel, associate product manager at LinkedIn. Beyond its new look, LinkedIn Jobs now includes a handful of new features for both Premium subscribers and traditional account holders. The new design is rolling out to all users over the next few weeks. Here's a look at what's new. On the new landing page for LinkedIn Jobs is a section called "Jobs you may be interested in," which lists open positions it thinks might be a good fit for you based on your experience, current location and information you have listed on your profile. You can also choose to receive daily, weekly or no email alerts for new jobs by clicking the link at the top. Below "Jobs you may be interested in" is a new feature called "Discover jobs in your network" that highlights the companies you have connections at and who can refer you. Clicking on a company takes you to its LinkedIn page where you can browse your connections who work there and view the open positions. 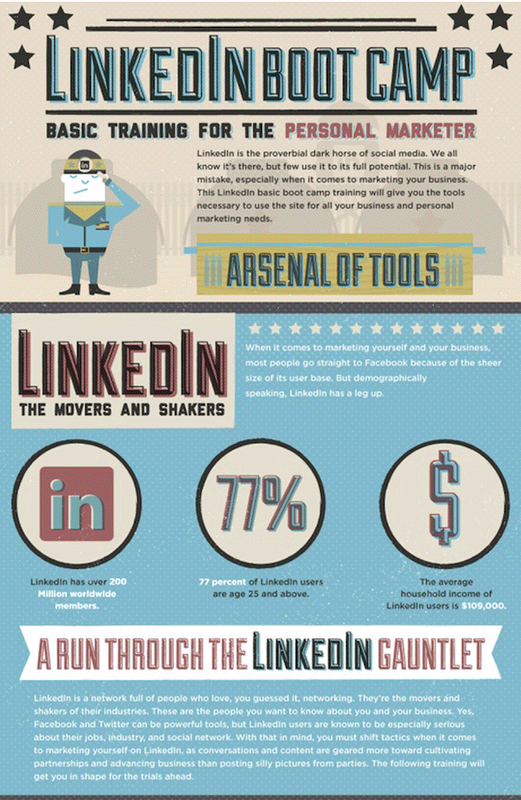 INFOGRAPHIC: How Can Facebook and LinkedIn Get You a New Job? Most recruiters hire through LinkedIn (94.5%), and some use Twitter and Facebook as well (42% and 33%, respectively). 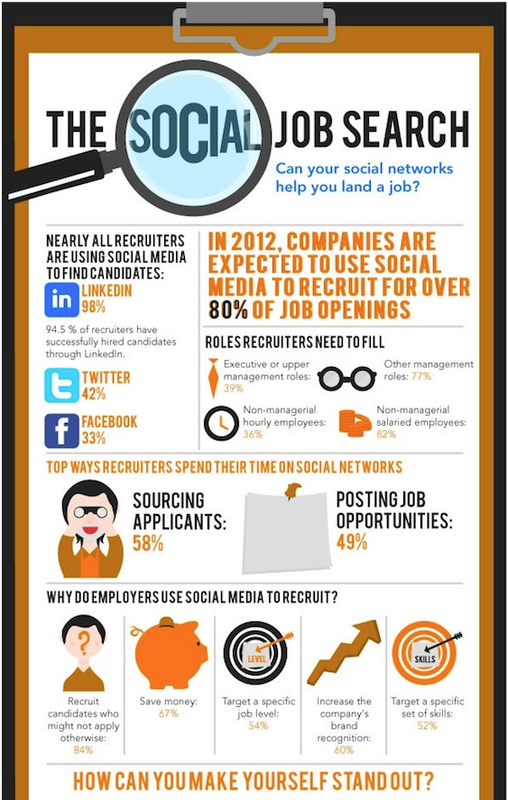 See more at How Recruiters Use Facebook, LinkedIn and Twitter (Infographic). Especially among college students and young professionals, LinkedIn is a weaker, uncool version of Facebook. We all know LinkedIn is there – and capable of providing personal growth – but not many of us pay attention. Perhaps we’re not comfortable with business networking. Or maybe we feel the site is targeted to older, more established professionals. This is a major mistake however, especially when it comes to marketing ourselves and our job search. 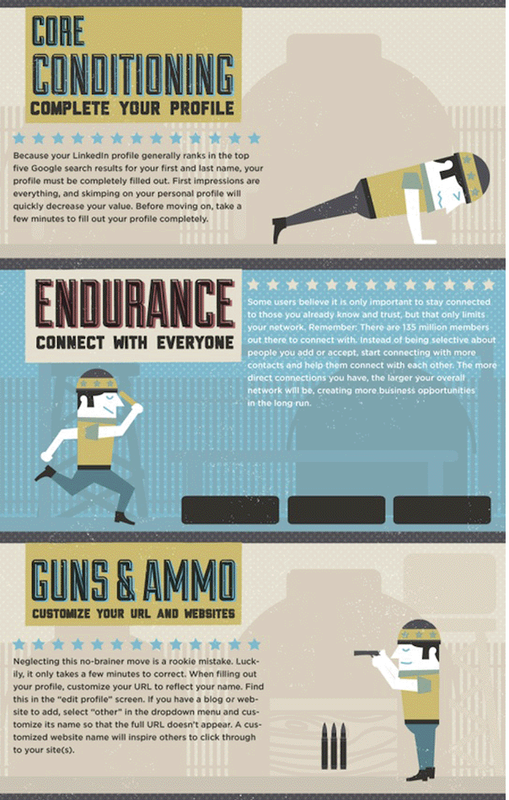 Check out this infographic from mindflash, a “LinkedIn Bootcamp”, that outlines tips to beef up your personal marketing muscles for better networking – and a much stronger job search. Businesses have started burnishing their identities by creating their own content on LinkedIn.The professional network hit its 200 million member milestone recently, and companies naturally want a slice of that massive audience’s interest. While brands have started to get a hang of what kind of posts work on Facebook, optimizing user engagement on LinkedIn remains uncharted territory for many companies. Company pages launched approximately three years ago, senior product marketing manager Lana Khavinson told BI. And it started primarily as a home base where companies could showcase themselves with basic features and descriptions. Khavinson, who specializes in creating strategy and marketing programs for small and medium businesses, said that what a company posts to optimize its chances of getting shared doesn’t so much have to do with its size, but rather by industry. “On LinkedIn, context matters,” she said. “When [people] follow a company, they are raising their hands and saying, Company we want to hear from you.” And that message has to be in line with its image and message. Khavinson told us what works and what doesn’t. Post what your audience is interested in. LinkedIn published companies’ most “Liked” posts on the site for Q4 2012. While Google got the most likes out of any business (for a post that said it was the #1 most desired employer on LinkedIn), Jolla — a Helsinki based mobile device developer — had a post that got the most shares of any small business. “They are staying true to what people are interested in,” Khavinson said, by posting about product updates. It might not be funny or quirky like many Facebook posts, but it’s what people want on that medium. It isn’t all about the numbers. For example, even though Google is the company that got the most likes for a single post, that number still didn’t break the 500 mark. A successful small business post likely wouldn’t make it to more than 100 likes. But that’s not the point. Khavinson continued, “we are trying hard to teach companies that we aren’t comparing Facebook to LinkedIn. Users want news and imagery. When people first hear about a company, Khavinson said that one of the first things they’ll do is go to that company’s LinkedIn page to learn more. “Presence is key,” she said. The goal is to gain followers and then build a community — and that’s done through posting information and updates that will interest and engage its audience. Khavinson said that research shows that followers aren’t only looking to find a job at a certain company, but that the vast majority wants to see industry news. This means diverse, industry-related posts with a strong image and an interesting title. Are you stuck in a dead-end job? Not making the money you deserve? Just need a change? But afraid your boss will find out if you start looking for a new job? LinkedIn to the rescue! If you have used your LinkedIn account sparingly and all of a sudden there’s a flurry of activity, this might be a red flag to your boss. Therefore, if you plan to make major edits to your profile, go to Settings and turn off your activity broadcasts until you have completed your updates. Then turn them back on. To be on the safe side, you may want to make changes over a period of time rather than all at once. Keywords. Use plenty of the keywords hiring managers and recruiters might use to find people with your specialties and skills (e.g., job duties, titles, industry certifications, software expertise, etc). Experience. Include a detailed description of your accomplishments for every job entry you include in this section. You’re trying to differentiate yourself from other job applicants, so don’t skimp here. Headline. You only get one shot at a first impression. Make it a good one. It’s short—only 28 characters—so you’ll need to be creative. And be sure to include your best keywords. Skills. LinkedIn members will give you Endorsements for your skills, and you’ll want to focus on including the skills you hope to use in your new job. Education. In addition to your general educational background, include any specialized courses you’ve completed. Describe them in detail and use lots of keywords. Projects. Use this section to highlight specific job-related projects. You can link to a web page where the project is displayed. Seeing is believing! Special Profile Sections. Options include Languages, Test Scores, Publications, Courses, and Patents. These are a terrific way to impress readers of your profile and differentiate yourself from other candidates. Honors & Awards. If you’ve got them, flaunt them. Recommendations. Outside corroboration of the information on your profile is extremely important. Try to get at least two or three recommendations for each job and educational entry. You probably don’t want to ask your boss for a recommendation, but customers, vendors, and college professors (for recent grads) are great options. As much as it’s convenient to merge our Facebook, Twitter, Tumblr and Instagram accounts into one large social networking experience, LinkedIn has a special designation: professional networking. In fact, data shows that LinkedIn is especially helpful when it comes to landing higher-paying jobs—”informal recruitment” is a favorite of hiring managers aiming to fill positions up there on the payscale. So whether you’re hunting for a new job, making the most of the one you have or just looking to learn about professional possibilities, avoid these eight big LinkedIn mistakes. She also makes a great point: If you leave a networking event with a handful of business cards, intending to follow up on LinkedIn, it’s much harder for you to remember who’s who without pictures. A missing photo can easily lead to missed connections. If you’re worried about unwittingly sabotaging your career through social media, check out the ten worst blunders you can commit. Plus, those people you’re updating in your LinkedIn network are valuable. “If you’ve got a great following, it’s part of the assets you bring to the table,” she adds. How can your LinkedIn profile be found by the companies you want to work for? How can you get companies to find you as the solution they need? It’s by understanding personal branding. Why do you do what you do? Why would someone want to be in business with you? Differentiate yourself from the competition and stand out from the rest – personal branding is the ‘secret’ to being discovered for your talents! Your brand is what defines you and it’s something we all have; it simply needs to be unearthed. Determine what type of style or personality you have, how do you want to be seen or found, and also what niche do you want to claim to be the expert or go-to person. Work it over and over until you can find clarity with your branding message. Once you can pinpoint with clarity what makes you unique, valuable and worthy, you can leverage this to proactively reach your goals. So what niche do you want to own? Here are five ways you can become discovered as you start your journey of self-discovery! Be confident in what you can offer and stick to that ‘message’ as you should live and breathe your brand. This doesn’t mean you just turn it on during an interview or business meeting, but focus on your brand, who you are 24/7. You may struggle at first, but take a step back and look at this from the perspective of you as a whole person. This will help you create the credibility and trust needed because your brand will be a reflection of the true you. People are attracted (or buy from) people they trust and like. Put some personality into your brand and the likeability will be there too! Everything about you needs to communicate and support that brand positioning. Connect with like-minded individuals, join relevant groups, and customize your profile to reflect your message. Think key words and think about how you want to be found. Be proactive and offer advice or share articles that support your message. You don’t need to author a new book, rather share or comment on what is already out there. Position your personal brand so that you are perceived as the best logical choice by including the key elements in your LinkedIn profile. Utilize the sections ‘above the fold’ to describe your brand. This includes your headline, contact info, opening statement in the summary section. And don’t forget a professional photo! Branding key words should be represented in all parts of your LinkedIn profile.